The board taunts you after each roll. Stop. If you stop, you’ll be safe. Your opponents taunt you in the other direction. Just keep rolling. You’re probably okay. And you’re caught in the middle. If you quit now, you may open up opportunities for your opponents to steal the game from under you. But if you keep going, you might lose your progress and have to start over next turn. But the game is aptly named. You just…can’t…stop. 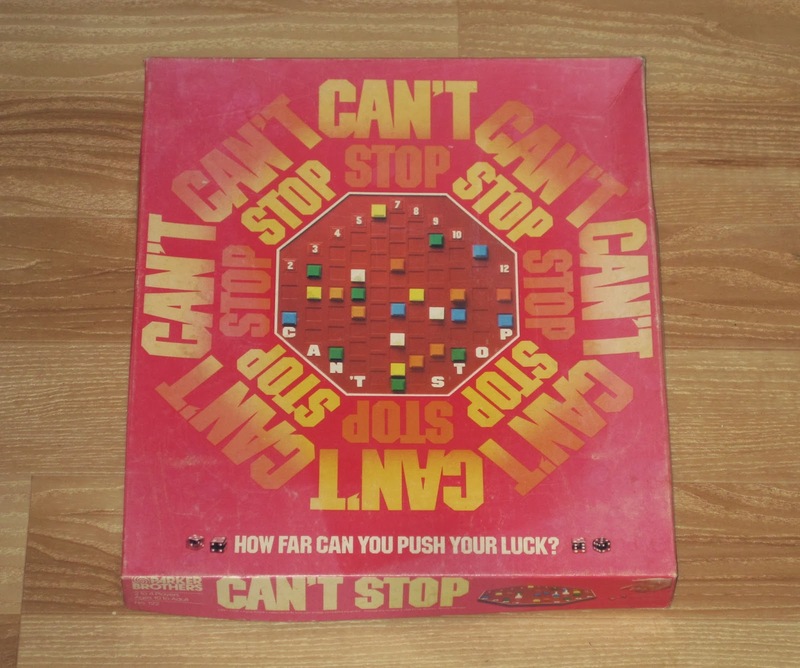 Can’t Stop is a dice-rolling press-your-luck game for two to four players. Players compete to claim columns on the stop sign board, and the first player to claim three columns wins. 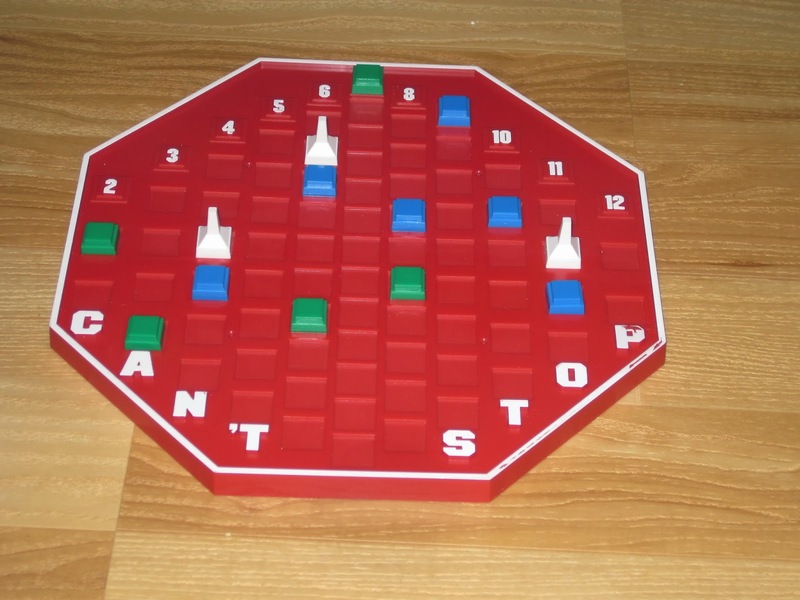 Can’t Stop is played with four dice, player markers for each player, and three “runners,” which track a player’s gains for the turn. The stop sign board has columns for the numbers 2-12, representing the possible sums of a pair of dice, with the longer middle columns representing numbers with higher probabilities (6, 7, and 8) and the shorter edge columns representing numbers with lower probabilities (2 and 12). The rules of Can’t Stop, full stop. This is a very simple game. The game is played in turns. On each turn, players roll four dice as many times as they want until they either bust or stop. 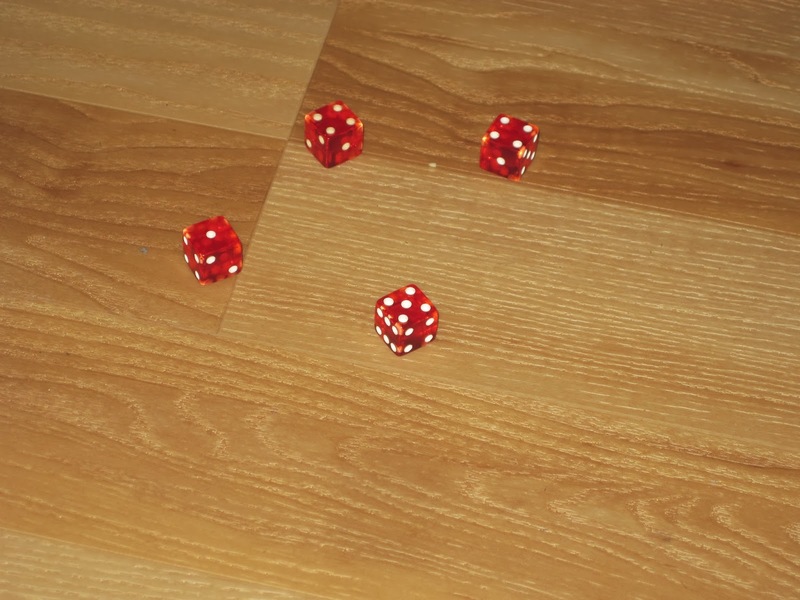 After each roll of the dice, the active player divides the four dice into two pairs. In order to keep playing, at least one of the pairs must be able to place or move one of the white runners. The player must place white runners in a sum column when able. The player can stop at any time, placing a player marker where the runner is to track progress for future turns. If the player rolls the dice and cannot place or move one of the white runners, the player loses all gains for that turn and play passes to the next player. When a player reaches the top of a column, players may no longer place markers or runners in that column. The game ends when one player reaches the top of three columns. That player is the winner. Can’t Stop is a super simple concept born from super simple components. The heart of the game is four dice and some player tokens. Yet from these simple components rises one of the most compelling press-your-luck gaming experiences (without money on the line). What makes Can’t Stop so great is that Sid Sackson nailed the razor-edge decision that makes a press-your-luck game compelling: the game has to offer enough incentive to entice players to keep going, but the penalty for a player pushing his or her luck too far must be a reasonable deterrent. If there is no incentive, conservative play wins the day–the result is boring. But if the penalty for going too far is a mild wrist-slap, then there’s not much to differentiate players’ evaluation of the game state–the game becomes too random or forgiving. In Can’t Stop, the reward for persistence could be claiming a column–a huge boon, given that the game is a race, and it gives all players fewer safe havens when choosing pairs. The penalty for going too far is a loss of all turn gains, which can be devastating if it happens too many times in a row (or if playing against an incremental-gains player). Can’t Stop is finely tuned so that the decision whether to keep playing after each roll is tough. Can’t Stop isn’t perfect, though–or, I should say, it’s not perfect for everyone. For one thing, there can be a decent amount of downtime in the game. Players only act when it is their turn. Of course, this is a matter of perspective. In some games, watching another player take a turn is an excruciating experience, especially if that player suffers from analysis paralysis and must weigh every option carefully before doing anything. In Can’t Stop, it’s true that the inactive players aren’t doing anything game related, but I’m still invested when it’s someone else’s turn. Whether I’m trying to convince them to stop or keep going or yelling “Bust!” as loudly as I can, there’s always something to do. This investment in other players’ turns isn’t mandated by the game, though, and not every player will like it, but I don’t mind it. Still, because of the potential downtime, I think my favorite way to play might be with two (although it’s also fun with more players). Some players might also feel that the game is too luck based. After all, the game is played with dice, which are often anathema to strategy gamers. Yet despite the game being played with a completely randomized element, there is enough strategy to keep player decisions at the fore. Knowing the probabilities helps here, but so does smart planning (for example, pairing a commonly rolled pair with a less common pair to increase your chances of climbing higher in the column). I don’t find this game to be too random, especially given its nature as a press-your-luck game. That a perfectly played game can still escape you is a reminder that even with solid math, a game can still be outside your complete control. This is a good question, and Can’t Stop seeks to answer it. DICE. In Can’t Stop, you live and die by these guys. Can’t Stop is the quintessential press-your-luck game. It’s abstract (so not the thematic press-your-luck romp that is Incan Gold), but it’s engrossing without a theme. This is a game that my wife and I enjoy quite a bit whether it’s just the two of us or a friend or two can join us. It’s fun to feel the rush of being a high roller. It’s equally fun to yell “Bust!” at your opponent–and to feel the power of your words as they negate their hard-earned gains with foolhardiness. 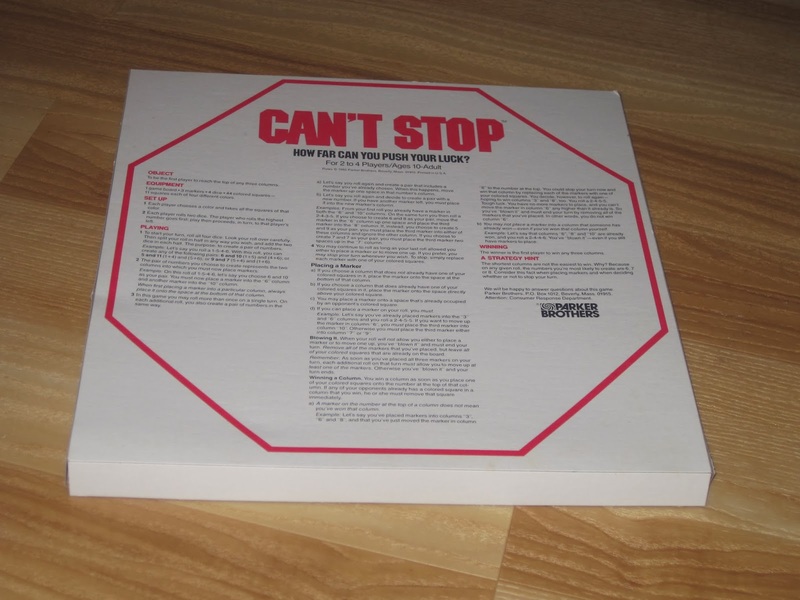 Can’t Stop could also be educational if you use it to reinforce sums or probability with kids. (And hey, it’s more fun than the math “games” we had in my classrooms when I was a kid.) Can’t Stop isn’t a meaty game, and it feels like a filler, but it’s probably my favorite press-your-luck game. It offers compelling choices in a quick time frame, and it’s fun to boot. I highly recommend this one if you’re looking for a pure press-your-luck experience.